Winning Form Factor. Winning Features. 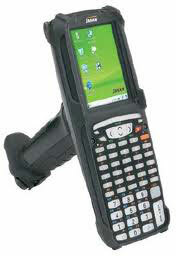 The Janam XG105 is a rugged workhorse for customers that need close-range and distance barcode scanning as well as reliable capture of barcodes that are damaged or underneath shrink wrap. With industrial-quality construction and the best-in-class, high performance scan engine, Janam XG105 delivers unrivaled performance, scanning range, and durability. It is loaded with efficiency-enhancing features such as pre-installed Wavelink, Avalanche, and TE, well-spaced keys and mobile DDR memory. The XG105 features Summit Wi-Fi radio, is Aruba and Cisco certified and delivers open air range up to 150' greater than competitive devices. And with the battery in the handle, Janam products are incomparably light and balanced in hand, making them ideal for scan intensive, extended shift use in demanding environments. Battery, 7.4V, 2500 mAh, Compatible with Janam XG100/XG105. The Janam XG105W-ZDGFBV00 is also known as Janam Technologies LLC	JAN-XG105WZDGFBV00	or XG105WZDGFBV00	.